The H.Upmann Coronas Minor Tubos is an accessible Coronita cigar, with 40 ring gauge, 4.6” (117mm) long and comes in a box of 25 cigars in aluminum tubes. Mild to medium cigar, easy to carry around in its tube, it is a great smoke to carry around for a short break in the morning or an afternoon stroll. Fairly complex smoke with typical Cuban twang note, some cedar, earth, leather and a good amount of slight spice. To top it all, its reliable construction gives all the more reason to keep one at all time in the humidor. The H.Upmann Coronas Minor Tubos is an excellent pick for a short, reliable, easy to smoke cigar and when the time is of the essence. • Mild to medium cigar, not very complex but with consistent construction and typical Cuban flavors. • Great aging potential. The aluminum tube is ideal in that purpose. This cigar simply delivers the Cuban experience in a convenient packaging and at an affordable cost. When removed from its beautiful aluminum tube, the H. Upmann Coronas Minor is looking good, with a nice medium brown wrapper with some reddish tones and it seems fairly tightly rolled. There are few minor veins on the wrapper, nothing major, the seams are almost invisible and the triple cap is beautifully applied at the head. The cigar is pretty firm to the touch, with a minimal give when squeezed. At cold, the head of the cigar smells of light hay, with some notes of oat. The cold draw gives some plain tobacco flavors. Due to its small ring gauge, it is preferable to use a guillotine (straight) type of cut rather than a punch cut. The draw on this Coronas Minor is rather tight, but good enough to be able to smoke it slowly. The first flavors to reach the palate upon ignition are of potent black pepper, with some tones of woodiness and of toasted bread. There are also some flavors of espresso and of deep musky earthiness. The body is at a medium level for the first few draws. The finish is long lasting. The cigar burns slowly and on a pretty even line, only one touch-up is required while smoking it. A dark gray ash is developing at the foot and the cigar releases huge amounts of smoke. 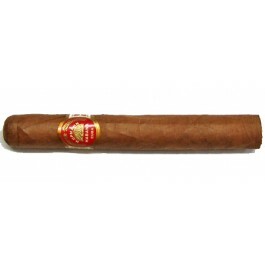 The strength present in the opening of the H. Upmann Coronas Minor recedes after few draws. It gives you the opportunity to enjoy the nice complexity of flavors in the first third. The dominant flavors are of deep earth and of classic Cuban twang, mild peppery/spicy notes. There is a nice creamy/buttery taste to the cigar, with some toasty notes, some toasted cereal, and roasted nuts, such as peanut or macadamia. This is a beautiful smoke so far. In the middle third, the pepper notes recedes and there are now muskier notes in the foreground, some leather; it is musty, earthy. The flavors work very well together because the smoke remains very oily and creamy. There are still some hints of toastiness. This Coronas Minor must be smoked slowly to be able to enjoy the nuance of flavors. In the final third, the creaminess is still around, as well as the leather and the toasty flavors. And the spiciness makes a come-back, but remains subtle. The leather is still there and some herbal notes are appearing, like some mint or parsley. The flavors are still very balanced and not too strong. When smoked slowly, it remains cool until the nub. In summary: an ideal smoke for an afternoon break, it is smooth, tasteful and has the most convenient packaging.